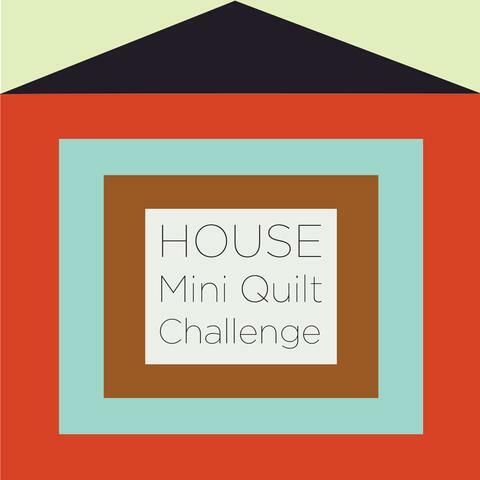 This month's theme for the Curated Quilts mini quilt challenge is "house." Originally, I was un-inspired by the prompt. However, once I started thinking of "home" instead of "house," I realized our recent move could be the inspiration! I dug through my stash to find the required color palette. I started by finding topographical maps for our area - including our nearby lake. 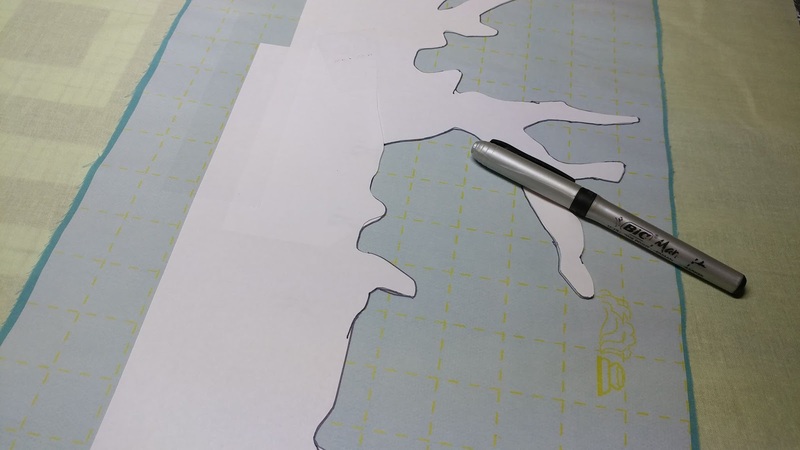 Next, I printed a template that was 16" tall of the lake shore. After fusing the blue fabric to Lite Steam-A-Seam 2, I traced the template onto the paper side of the fusible. 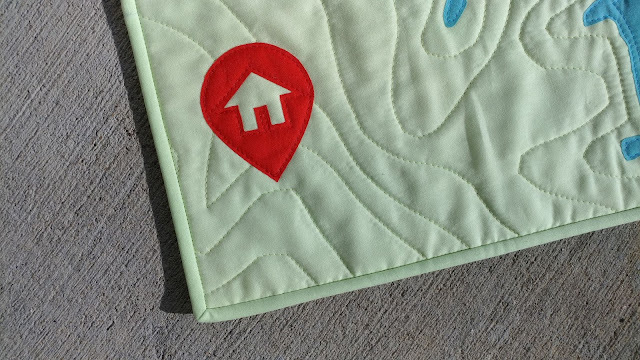 I also put the fusible onto the red fabric and cut out a map locator icon with a house inside (the most obvious nod to the theme). After fusing the lake piece to the green background fabric, I pin basted the quilt using a scrap of Warm & Natural batting and a fat quarter of a green Fossil Ferns print by Benartex (I won a box of 90 fat quarters awhile back - this is the first one I've ever used!). 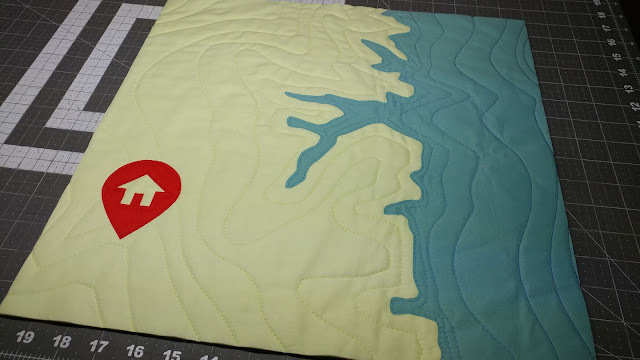 I used the walking foot on my Juki TL-2010Q to stitch the topographical lines onto the quilt. 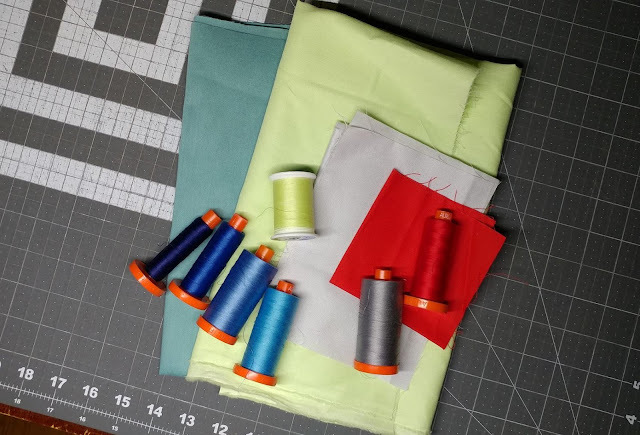 For the lake, I used four shades of blue in Aurifil 50wt (Bright Teal #1320, Light Wedgewood #2725, Medium Blue #2735, and Dark Navy #2784. I used the lightest blue along the shoreline, then two lines of each thread color, ending with the darkest. Once the quilting of the land was done (a light green thread by Coats & Clark from my stash), I fused the house icon to the quilt and stitched just inside the raw edges with Aurifil 50wt Lobster Red #2250. 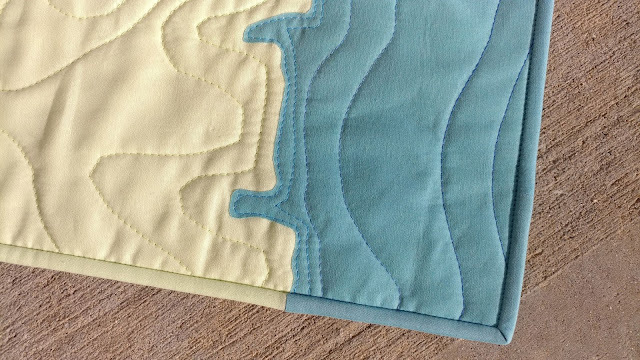 I decided I wanted to try matching the binding with the water and land, so the binding wouldn't detract from the mini. I started with the 45 degree mitered join at the top of the quilt. For the bottom join, I just went with a straight seam. It doesn't perfectly match the angle of the water, but it was better than a 45 (at least for my sanity!). Of course I machine stitched it on (the tutorial for how I do that is here). 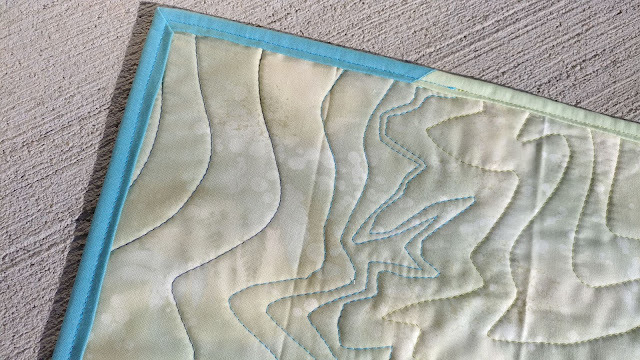 I used the lightest blue thread on the water portion of the binding, and the light green thread for the land. Overall, I'm very pleased with how the mini quilt turned out! The quilt measures 16" square and is my 41st quilt finish for the year! And now I have a keepsake of our new house! 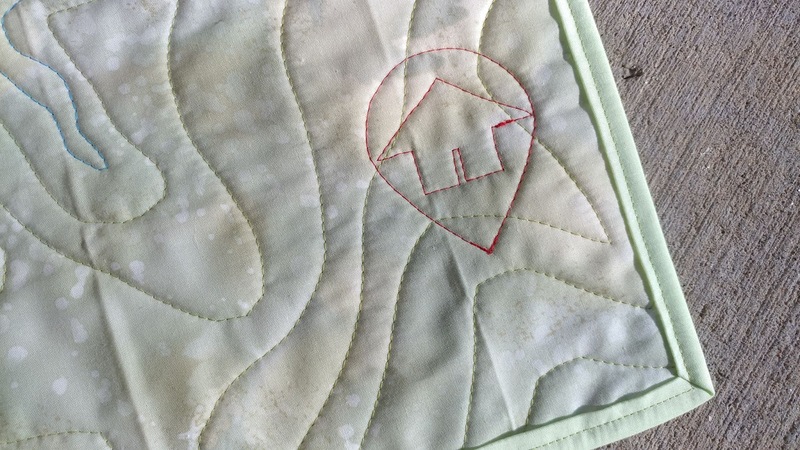 Linking up with Curated Quilts' House Challenge. Wow, wow, wow!! 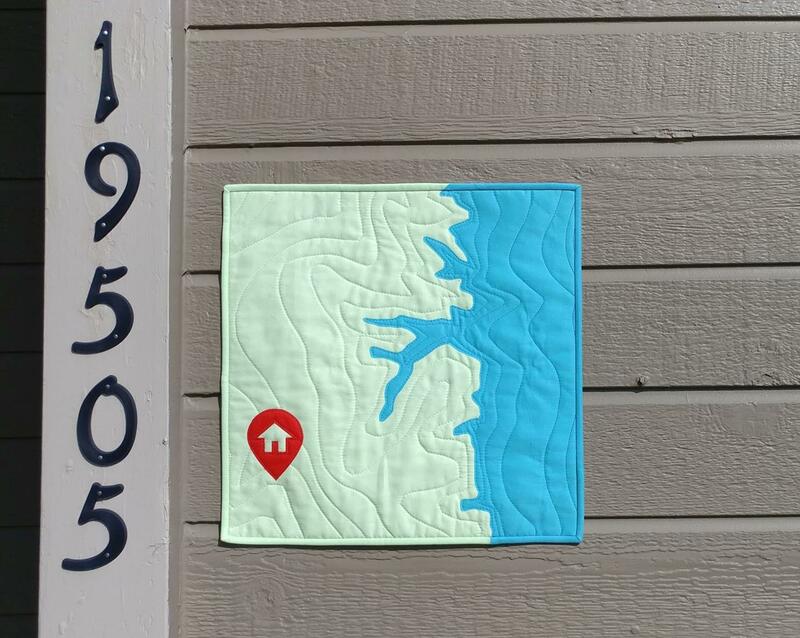 I love your mini quilt and especially your unique take on 'house' for the challenge. That was a wonderful inspiration, AND a fabulous execution of it. It is everything it needed to be, and so much more. You are very creative!!! This quilt is so perfect for the front of your house. That is amazing! I just moved to a new home this year, and I might have to borrow your idea. It's fabulous! I love it! Such a clever idea, and so well-executed! What a creative approach to the challenge! Well done! Clever and well done. 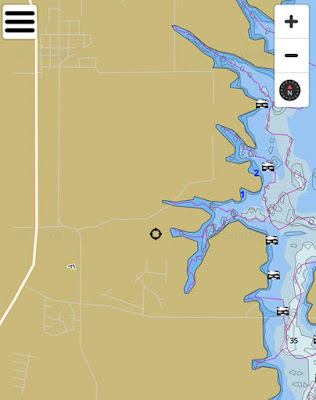 What lake is it? Such a creative idea! 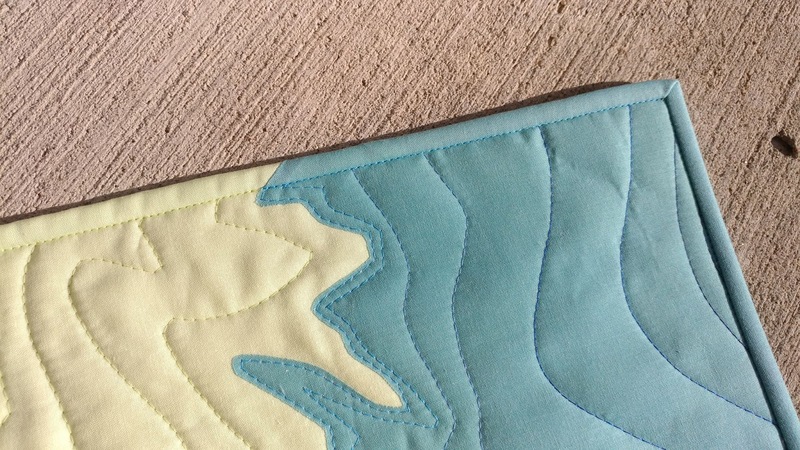 I love that you matched the binding to the quilt, too. I really love seeing how you respond to challenges, Laura. This is a great, creative solution and the mini turned out great! Such a perfect quilt for the challenge. Good luck! What a beautiful, amazing way to commemorate your home. Great idea and well executed! That is a great idea. I love how it turned out. 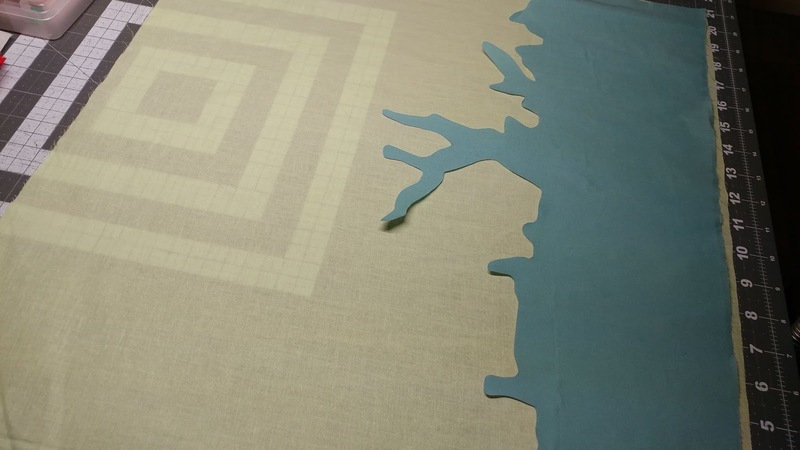 You are a quilting genius! 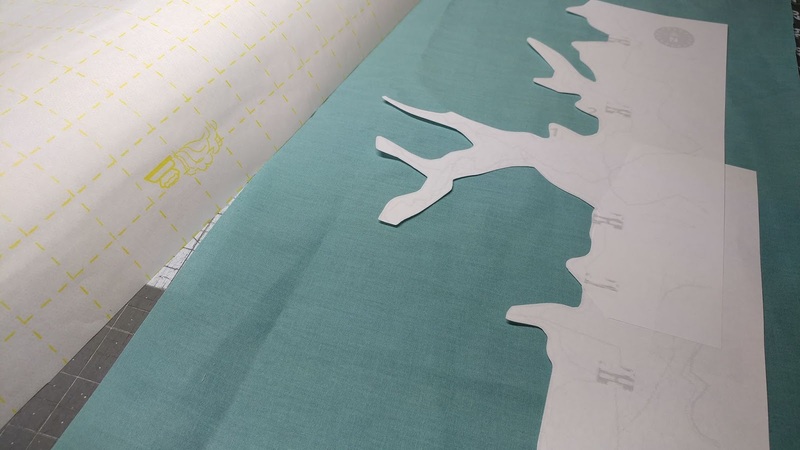 I love watching your ideas flow to fabric. Your posts are so full of your thought process and how you turn these challenges into finished projects. I certainly would never of thought of taking that topic and making it so personal. Congratulations. You always amaze me. This is so clever! You win!! I have no idea if this is a contest or not, but you win in my book :) very clever. Very creative. The quilt makes the house much more a home. Thanks for sharing the process, too. Wow, what a great idea on so many levels! 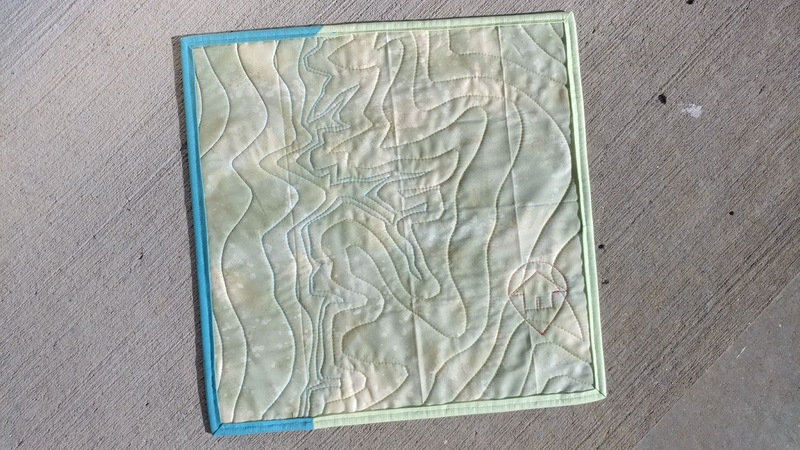 I especially love using the topographical lines as quilting! This is seriously clever and so fun. WOW so out of the box. I could never think of this. You are amazing. I hope you win. You deserve to win. That is so great! Fun idea. This is so darling! 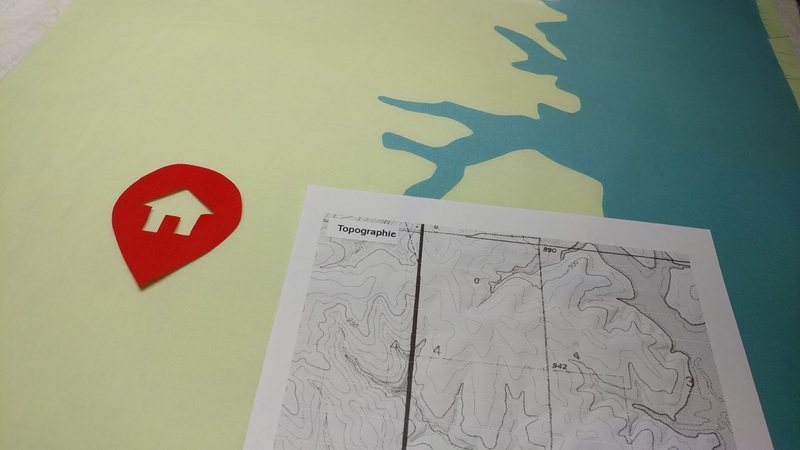 I love the binding, and how you used the topographical map instead of a street map. And the Google-type marker is great! Just a fun, happy project all around.